This program is designed to assist low to modering income buyers and offers eligible buyers up to a 5% grant (5% of the purchase price) to be applied toward closing costs and / or their down payment. Available grants: 0%, 3% and 5%. The 0% grant has the lowest interest rate and as the amount of the grant increases, so does the interest rate. The interest rate is set by CHF and is subject to change periodically. Because this California down payment assistance program is a grant, the money does not have to be repaid and there is no loan (aka silent 2nd or junior lien) that is recorded against Title like in other programs such as the CHDAP program. 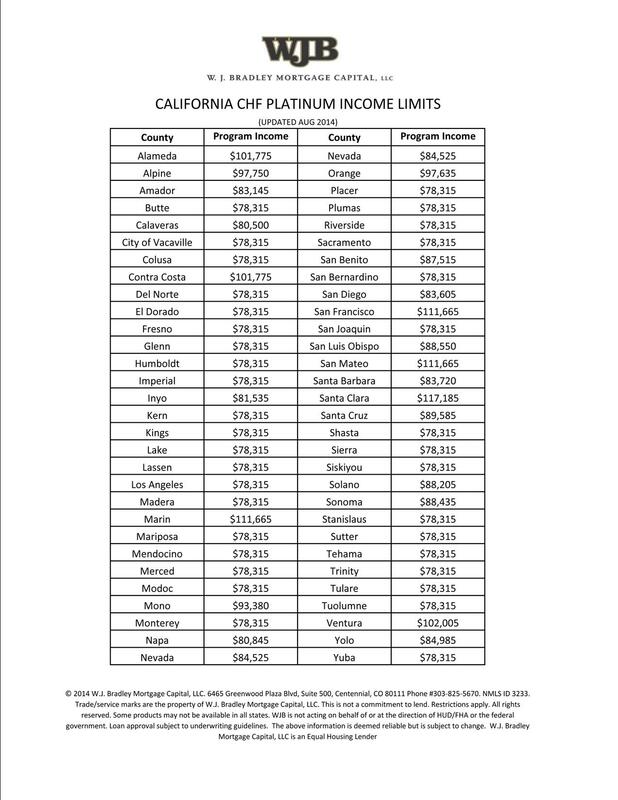 The applicable loan programs when using the California CHF Platinum down payment assistance program are the following: FHA, VA, USDA or MyCommunity (Fannie Mae). Unlike the CHDAP, there is no homebuyer education required when using FHA, VA or USDA financing. If using MyCommunity financing, homebuyer education is required. And, unlike the CHDAP, the buyer does NOT have to be a first-time homebuyer to use the CHF Platinum down payment assistance program. Buyers always ask me how to finance closing costs into a purchase loan. It's not quite like wrapping the costs into a refinance. But there is a way to get the seller to cover some (or even all) of your closing costs and be willing to do so. Let's say the asking price is $250,000 for the home you want and you feel that is a fair price based on the sales your Realtor has shown you. And let's say all of your closing costs, including the recurring and non-recurring (tax & insurance impounds), come to a total of $5,000. You could make your offer for $250,000 and ask the seller for $5,000 back for closing costs. However, the seller (in this case) would only NET $245,000 and may not find this offer attractive (it all depends on the market, of course). Let's assume there are multiple offers. You may not want to make an offer like this, but assume you still want your closing costs paid. How do you do this? One way would be to offer the seller $255,000 and ask for the $5,000 as a credit towards recurring and non-recurring closing costs. This way the seller will NET the $250,000 they were asking for. Or to offer them an incentive, you may offer them $256,000 and ask for $5,000 towards recurring and non-recurring closing costs. This NETS the seller an additional $1,000, which may raise your payment a nominal amount per month, but depending on the number of other offers, and how competitive the market is, this might be a smart way to incentivize the seller to accept your offer. To see what you qualify for, and to discuss some strategies designed to make your offer stand out, simply click the button Apply Now.